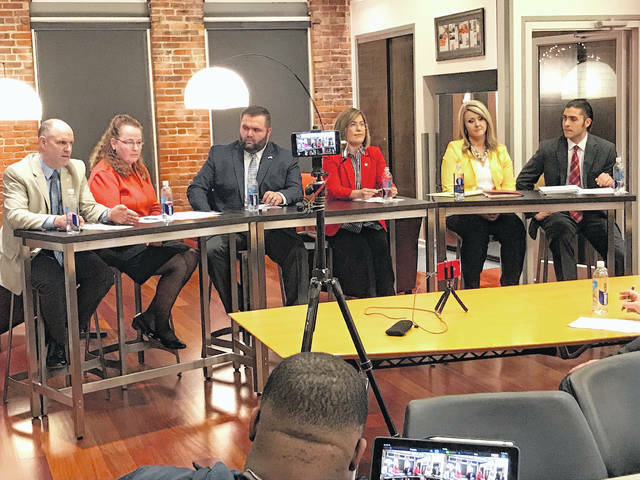 Southern Ohio needs a bit of a renewal, according to numerous comments made by several of those who took part Tuesday evening in a forum involving all six declared candidates for the Ohio House 90th District seat being vacated by incumbent Dr. Terry Johnson, who cannot run for re-election because of term limits. “To keep moving forward, we need new ideas,” said Republican candidate Gina Collinsworth, who argued this is a critical time for the district, which includes all of Scioto and Adams counties, along with a slice of Lawrence County. Collinsworth is one of four Republicans running for the seat. The others are Adams County Commissioner Brian Baldridge, Portsmouth residents Scottie Powell and Justin Pizzulli. Two Democrats are also in the race: Portsmouth residents Adrienne Buckler and Joni Fearing. Baldridge is the only candidate to have ever held public office. Buckler talked about the possibility of a new voice in Columbus being a good thing. “I’m running to be our voice,” Buckler said, adding an assertion that her voice would be somewhat unique, being that of a young woman who is not a professional politician. The forum was sponsored by the Friends of Portsmouth, and moderated by Friends member Michael Seifert, who asked the candidates roughly five questions. Candidates all received up to two minutes to respond. One big topic was economic development. Powell claimed the area has lost a lot of jobs in the past 10 years, and that issue is probably the biggest concern in the district, adding the area needs to work on improving and modernizing its infrastructure, and that it can no longer depend on heavy industry alone, but must diversify. For example, Powell noted what he called a “huge insurance hub” had been built about two hours from here, hinting Portsmouth could have gotten – and maybe still could grab – a piece of that economic pie. Baldridge agreed the area needs to work on its infrastructure, and bragged he has direct experience in working with bringing companies to the area. Baldridge several times seemed to at least hint at the fact that he is the only person in the race to ever hold public office, though some candidates, such as Buckler, hinted that not being a political insider is a good thing. “It’s something we all need to work together on,” Collinsworth said regarding the subject of economics. For his part, Pizzulli said officials must come up with a formal business plan for all of the area, pointedly noting he holds a master’s in business administration. “I’m going to be focused on Main Street Ohio, not Wall Street,” Buckler said, agreeing with several of the others that job creation is the No. 1 issue for the district. Touching on a subject that has grabbed lots of headlines recently, Seifert mentioned that a ban on certain types of weapons has been introduced in Columbus. Pizzulli said he does not support any kind of weapons bans. Fearing said there is no reason for any civilian to own an assault rifle. “Even Ronald Reagan said that, I’m not going to beat around the bush,” Fearing said, adding she supports strengthened background checks and closing supposed gaps in sales at gun shows. Fearing said she is not going to take anyone’s guns away, but added that a “common sense” approach to gun control is needed. Other topics touched on during the roughly hour-and-a-half forum included high healthcare costs and what many perceive to be an opioid addiction problem in this area. Collinsworth talked about someone she knows who has survived a heart transplant. She said you would think that dealing with the ramifications of that transplant would be that person’s biggest concern. Instead, she said, this person’s biggest worry is paying for needed prescription drugs. “We need to take care of our people,” Powell said, noting his work with the Ohio Bureau of Workmen’s Compensation, as well as his time spent with a health care center in Portsmouth. Fearing voiced support for universal healthcare. Seifert said this was the first such forum hosted by the Friends of Portsmouth. Even so, the proceedings were stopped only once – and then only briefly – due to some technical hitches toward the beginning of the evening. At least one compliant reached The Daily Times that the sound during the webcast was not the best. During the forum, Seifert complimented the candidates on staying within the allotted time, and even took the time to ask what he called oddball questions.